The name means ‘White Hill’. In 1828-50 William Griffith, formerly of Llangoedmor, lived at Bryngwyn. On 16th August 1836 William James, son of the late James James of Haverfordwest, died here aged 23. In 1836-42 William Griffiths was a burgess of Cardigan. In 1838 the 83-acre farm was owned by Captain Alban Thomas Davies and leased to William Griffiths. On 23rd April 1840 Margaret Griffiths, daughter of William Griffiths, married James Edwards, maltster of Cardigan. In 1841 the following persons lived here (though the address is given as Plas Newydd on the Census Returns! ): William Griffiths, 60, farmer; Elizabeth Griffiths, 60, his wife; John Griffiths, 30, their son; Thomas Griffiths, 20, son; Mary Williams, 30; and Rachel Thomas, 20. In 1842-96 Thomas Griffiths lived here. On 21st November 1849 Thomas Griffiths was ordained a Deacon of Blaenywaun Baptist Chapel. On 19th July 1850 William Griffiths of Bryngwyn died aged 70. In 1851-61 Elizabeth Griffiths lived here. In 1851 the following persons lived here: Elizabeth Griffiths, widow, 72, farming 130 acres; John Griffiths, her son, 38; Thomas Griffiths, son, 31 and servants:- Mary Davies, 31, house servant; Elizabeth Bateman, 19, Barn maid; William Phillips, 16, farm servant; and Leah John, 15, general servant. In 1851-68 John Griffiths lived here. In 1861 the following persons lived here: Elizabeth Griffiths, 82, widow, farmer of 140 acres; John Griffiths, 48, her son; Thomas Griffiths, 41, son; and 5 servants – Leah John, 28, dairy servant; Margaret Williams, 44, house servant; Anne James, 21, barn servant; John Griffiths, 19, carter; and William Gwyn, 14, servant. On 11th April 1865 Elizabeth Griffiths, widow of William Griffiths, died aged 86. In December 1868 John Griffiths married Margaret Phillips of the Briars. In 1871 the following persons lived here: Thomas Griffiths, 51; Catherine Griffiths, 45, his wife; Mary Williams, 29, general servant; Margaret Williams, 15, servant; Thomas Thomas, 18, farm servant; and George Evans, 15, servant. In 1881 the following persons lived here: Thomas Griffiths, 61, farmer; Catherine Griffiths, 55, his wife; John James, 23, farm servant; William Evans, 65, indoor farm servant; Elen Lloyd, 28, dairy maid; Elizabeth Michel, 18, general servant; and Elizabeth Lloyd, 55, visitor, dress-maker. On 8th June 1883 Bryngwyn was advertised for sale. On 13th December 1883 John Griffiths of Bryngwyn died aged 72. In 1887 Bryngwyn was occupied by Thomas Griffiths, John Morris, Charlotte Davies, Mary Davies and James O. James. On 14th March 1891 Catherine Griffiths died aged 65. In 1891 the following persons lived here: Thomas Griffiths, 71, farmer, widower; Maggie Lloyd, 21, his niece; Mary Davies, 21, servant; James O. James, 17, servant; and John Morris, 17, servant. Not long House, High Street. In 1894-96 Bryngwyn was occupied by David Volk. It was sold as part of the Parkypratt estate on 30th April 1896. 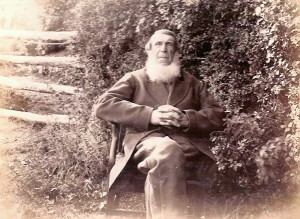 Thomas Griffiths died on 19th May 1896, aged 77. His photograph appears in Benjamin Rees’ 1899 book on the history of the local Baptist chapels. In July 1896 Bryngwyn was advertised to let. In 1901 the following persons lived here: Griffith Davies, 36, farmer; Eleanor Davies, 34, his wife; George R. DAvies, 4, their son, (Welsh-speaking); Shadrach J. Davies, 13 months, son; Susannah Richards, 30, sister-in-law, Martha James, 16, domestic servant; Philip Jones, 16, farm servant; and Charlie Evans, 14, cattleman. Except where stated otherwise the household was bilingual and all were born in the parish. In 1901-28 Griffith Davies was the farmer. In 1901-16 George R. Davies lived here. In 1918 Eleanor Davies lived here. On 21st December 1928 Griffith Davies, a Deacon of Blaenwaun Baptist Chapel, died aged 63. In April 1929 Bryngwyn was advertised for sale with 83 acres. On 10th July 1936 an ancient stone (c.400 A. D.) with a depiction of Christ upon it was conveyed from near Bryngwyn to Cardiff. In 1936-55 Ben James lived here. In 1938-39 Ronald James and Sarah John lived here. In 1940 Ronald James, Ben James, Wynn James, Neville James and John James lived here. On 3rd December 1940 Ronald James, third son of Mr. & Mrs. T. James of Tyhen, Rhoshill, and Bryngwyn, married Miss May Sambrook of Pentood Uchaf. On 2nd January 1942 Mrs. Ben James, nee’ Miss Blodwen Sambrook of Pentood Uchaf, lived here. On 31st July 1949 Ben James became a Deacon of Blaenwaun Baptist Chapel. In 1955 Annie B. S. James and Benjamin N. James lived here. In May 1969 the farm, including a 4-bedroom house, was advertised for sale and was sold in 1970. 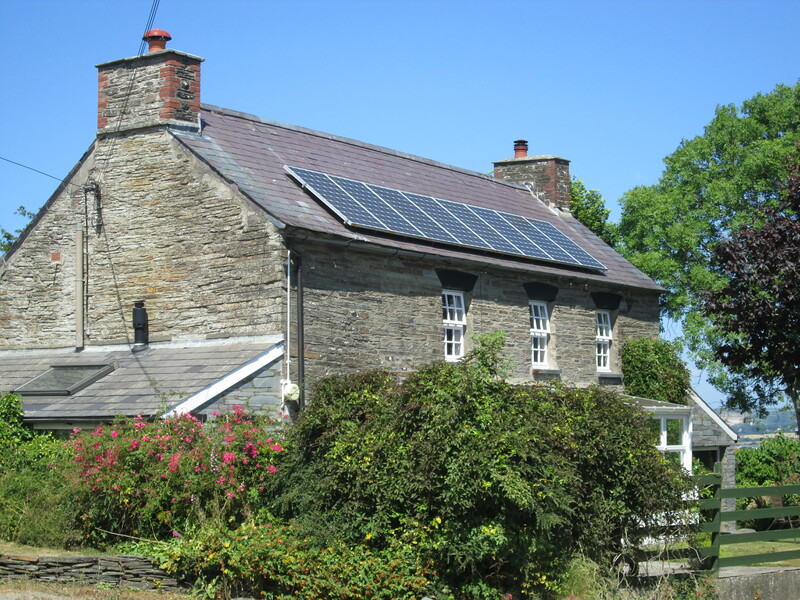 On 7th August 1973 part of Bryngwyn, including the farmhouse, was sold. 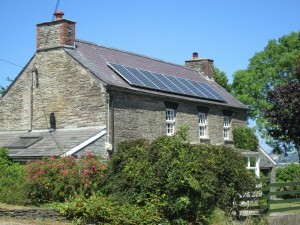 On 26th July 1974 and 8th August 1978 Bryngwyn Farmhouse was sold again. On 28th February 1983 Bryngwyn Farmhouse was sold yet again, and most recently on 22nd November 1986. On 19th November 1997 another early Christian inscribed stone was found nearby. Soon after the discovery, the stone was removed to the National Museum of Wales in Cardiff. Information supplied by Arthur Walters. © Glen K Johnson 14/08/2013.